Start getting the vision you deserve! With LASIK eye surgery, or advanced implants and cataract surgery, we can have you seeing better than ever without your glasses or contacts right here in Midwest Ohio. Whether it’s laser eye surgery, LASIK plus PRK, or cataract surgery with the latest implants lenses, peace of mind is a beautiful thing, especially when it comes to your vision. Knowing that you’re in good hands, knowing that your eye surgeons personally take an interest in you and knowing that he has the experience you demand. That’s why we have created the Stahl Vision Peace of Mind Promise. The Peace of Mind Promise is our guarantee that you will receive the most advanced laser technology, the most experienced LASIK surgeons in Ohio and some of the top cataract eye surgeons in the Dayton Ohio area, and a professional staff who will be there every step of the way. We are dedicated to the simple belief of providing our patients from Ohio the very best LASIK and cataract eye surgery experience with the results you deserve…and costs eye surgery here are affordable. For more than 20 years, Dr. Brian Stahl and his associates have dedicated themselves to vision correction so he could offer each and every patient in Ohio the quality eye care they deserve. This type of commitment is one reason Stahl Vision enjoys some of the best lasik eyes surgery results in the country for all types of vision correction including LASIK Vision Correction, LASIK plus PRK-as well as cataract surgery! With Stahl Vision’s exclusive Peace of Mind Promise you can be assured that everything that’s important to you, is important to us and we do it all for just one reason… your peace of mind. Stahl Vision LASIK Center, Eye Laser and Cataract Surgery Center for cataract surgery, and Laser Vision Correction of Dayton team together under one roof to provide Dayton’s leading eye care institute that provides medical eye care, cataract eye surgery and LASIK eye surgery care to patients throughout Midwest Ohio. Founded by Brian Stahl, O.D., M.D., a top LASIK surgeon in Ohio, more than 20 years ago-- the Stahl Vision team of eye surgeons (ophthalmologists) optometrists, technical and administrative staff is dedicated to your eye health and vision correction needs. Dr. James Knowles joined us in 2006 having served as Chief of Ophthalmology at Wright Patterson Air Force base. Together Drs. 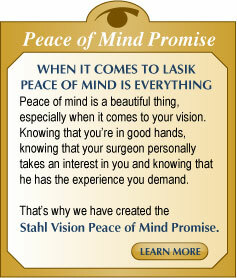 Stahl and Knowles are the areas most experienced LASIK and cataract surgery team. They are specialists in laser eye surgery, LASIK plus PRK, for laser vision correction of nearsightedness, farsightedness and astigmatism using the CustomVision™ procedure to achieve high definition distance vision, as well as monovision LASIK for near vision correction. Our laser eye surgeries are done at our in office facility, Laser Vision Correction of Dayton. Further, Stahl Vision offers LASIK plus the Visian ICL™, an implantable intraocular lens that is similar to an implantable contact lens, for those patients who are not good LASIK surgery candidates. 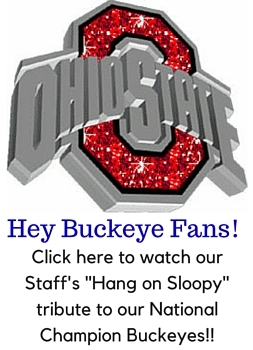 In addition to being top Ohio LASIK surgeons, Drs. Stahl and Knowles are well recognized cataract surgeons and offer Cataract Surgery with advanced technology Intra-Ocular Lens Implants (IOLs). As we age, our lens in our eye becomes cloudy, and eventually this cloudiness progresses to the point where it becomes a Cataract, and cataract surgery is something we will all need if we live long enough. Advances in lens technology have many people seeing better than ever after their surgery. These include aspheric lens implants to help patients achieve the best possible vision in dim lighting conditions, toric lens implants for better distance vision by correcting for astigmatism, and bifocal implants to help restore your near vision. Bifocal implants may help you see more like when you were younger and could see near and far. Some of these Advanced Lifestyle Lenses are the AcrySof® ReSTOR® IOL, the Crystalens® IOL, the Tecnis® Multifocal IOL and to help patients regain a fuller range of vision correction after cataract surgery. And surgery here is easier than ever, no shots, no stitches, and no hospitals-- our outpatient surgery center, Eye Laser and Cataract Surgery Center, in all under our same roof! As part of their commitment to your eye health and vision care, Stahl Vision provides comprehensive examinations, diagnosis and treatment of glaucoma including surgery and laser treatments for glaucoma should it be necessary and examinations and consultation for diabetic eye problems such as diabetic retinopathy. As caring Ohio eye doctors and surgeons, we know that the costs LASIK surgery or Refractive Lens Exchange (RLE) is a concern. After your eye exam, our coordinators will discuss prices and laser eye surgery costs, and any special pricing available for LASIK. If you have cataracts, our surgery schedulers will discuss the out-of-pocket expenses for your cataract surgery, and review your insurance coverage, deductibles, and copays. Whether it is for LASIK, which insurance does NOT cover, or for advanced bifocal implants with cataract surgery we offer financing to make your choice easier, subject to credit approval. Stahl Vision Institute for LASIK Eye Surgery in Midwest Ohio, our LASIK Center and Eye Laser and Cataract Surgery Center in Dayton Ohio are conveniently located and at reasonable costs LASIK surgery for patients from Sidney Ohio, Springfield Ohio, Urbana Ohio, Dayton Ohio, Cincinnati Ohio, West Chester Ohio, Eaton Ohio, Xenia Ohio, Jamestown Ohio, Franklin Ohio, Springboro Ohio, Waynesville Ohio, Lebanon Ohio, Mason Ohio, Oxford Ohio, and Middletown Ohio.